Designer Roller Shades offer a large range of custom fabrics, including Traditional, Natural and Soft fabrics that feature a classic look. Natural fabrics showcase characteristics typically found in woven woods and Soft fabrics offer elegant textures. 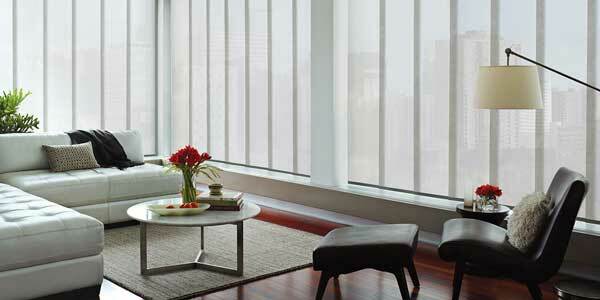 Roller Shades are available in a variety of lifting systems and design options by Hunter Douglas. One of the most important advantages of Hunter Douglas Roller Shades is that their traditional soft window coverings are have an ease of operation. A continuous loop, which works on the principle of a pulley, rotates a clutch to raise or lower the shade. From the fully raised position, pulling down on the front half of the loop lowers the shading. The covering is raised by pulling on the rear of the continuous loop. The cordless lifting system, found on Designer Roller Shades, is a traditional spring-assist system to raise and lower large window coverings, providing enhanced child and pet safety. Drop by our Crowfoot Showroom to View. 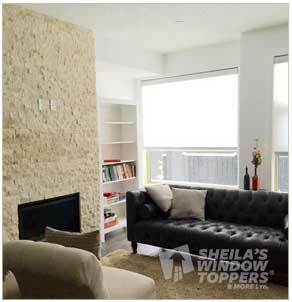 Hunter Douglas Designer Roller Shades are available at Sheila’s Window Toppers & More – Your Hunter Douglas Dealer Located in North West Crowfoot Shopping Centre. STOP BY TODAY FOR A POSITIVE SHOPPING EXPERIENCE!! Learn more about Designer Roller Shades. The Hunter Douglas Skyline Gliding Window Panels is a panel track blind that uses the same Designer Roller Fabric. Contemporary panel design provides a modern décor, whether covering large windows or when used on patio doors. Designer Roller and Designer Screen Shades in combination with Skyline Panel Track Gliding Window Panels — It’s your room, in perfect Harmony!